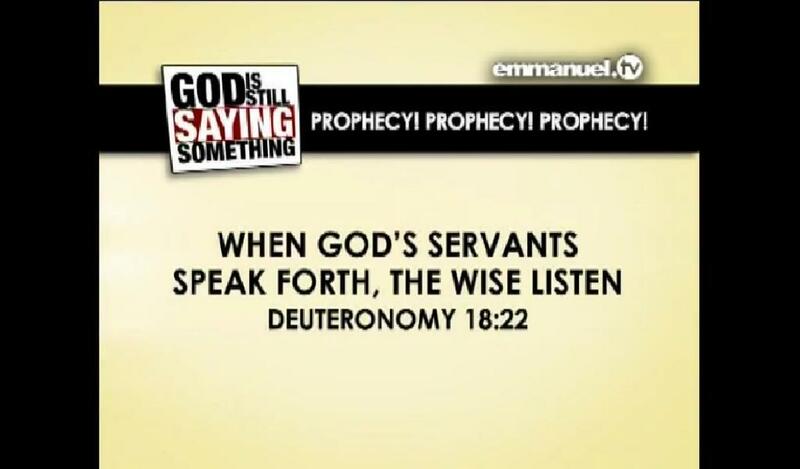 REPOST: God speaks through Emmanuel TV! We’ve heard SCOAN fanatics say that TB Joshua is writing the next book of the bible, but now it appears TB Joshua is rewriting the Old Testament as well. The interesting thing about this bible verse is that it’s not a bible verse at all. It’s not just a slight misquote, or a verse taken out of context in order to mislead (something that TB Joshua is also good at). It is completely invented, presumably by TB Joshua. Don’t take our word for it. If you look up this exact line, all you find is SCOAN and TB Joshua sites (or fans) quoting this ‘verse’. Allow us to google it for you. What a beautifully appropriate verse to introduce prophecies from a man who said that a bald man would score in the first half of the Champions League Final (completely wrong), who predicted that the Nigerian terrorist group Boko Haram would be ‘forgotten about’ by March 2012 (tragically wrong). The shameless self-publicist who constantly makes ‘win-win’ prophecies where he can either claim credit for averting a disaster or accurately predicting it. SCOAN are currently circulating a video on youtube claiming that TB Joshua predicted the recent attacks on US embassies in Libya, Egypt and Yemen. This shouldn’t really surprise us given that TB Joshua claims to have predicted every high profile tragedy that happens. However, this particular “prophecy” does help clarify the motives behind releasing these videos. As we have previously revealed, most of his prophecy videos are heavily cut so that the inaccurate details are removed leaving the prophecy seeming more accurate than it actually was. In this case, the video doesn’t seem so heavily edited but does clearly utilise his other favourite prophecy trick: probability. Why does he predict airplane crashes in Indonesia? Because they have a notoriously bad air safety record. Mass shootings in the US? There’s about 20 of them a year. Football results? Well that’s 50/50 and if he gets it wrong he claims it was because he instructed people to pray. So back to the prophecy. An attack on an embassy. A fire. People being brought out (seems logical you would evacuate people from an attack). A little research will show that attacks on embassies happen multiple times a year. Last year there were 9 attacks on embassies, the year before there were 13. If you read some of the news stories you see many involve fires, and yes – people will be evacuated (brought out). Is that all you’ve got TB Joshua? You could have named the country, specified that an ambassador will be killed (a very rare event), given a hint on what the motivation behind the attack would be, but no – you stick to the blindingly obvious. This, ladies and gentlemen is not a prophecy. It’s a probability. So what about the motive? The video is undated, so it seems highly unlikely that it really was a “recent” service because they would have been sure to give the date (feel free to give us evidence to the contrary in the comments). Therefore we can assume that this was not the first event matching the prediction, so why wait until this event? Because it was the biggest news story of the moment. Multiple attacks, an ambassador killed, a mysterious and controversial video. SCOAN weren’t waiting for any event to claim TB Joshua predicted it, they were waiting for a super high profile event so they could ride on the wave of news stories, shamelessly self-promoting off the back of a terrible tragedy. Did TB Joshua predict Steve Jobs’ death? The giant nation should pray for one of its hero. He has been wrestling for some time. It’s left to him and his family and God. Pray for the protection for this hero… we pray to see whether it is changeable. We are still praying for God to protect this hero. He is wrestling, wrestling. There is an ailment that will take his life. This is affliction. Prayer. As we have mentioned before, these vague prophecies are win-win for TB Joshua. If happens, it proves his prophetic powers, but if it doesn’t it was because his followers prayed against it happening. This post explores in more detail what is so problematic about TB Joshua’s so-called prophecies. Of course, the main purpose of this soothsaying is to allow TB Joshua to jump on the bandwagon of a popular news story. Does it glorify God? Does it support and encourage? No. It is a cheap and blatant attempt to glorify TB Joshua. Let’s hope that most people have the wisdom to see through it.